Paul Simon appeared on The Late Show with Stephen Colbert last night to talk about his upcoming 19-city tour in June, and how it will benefit the E.O. Wilson Biodiversity Foundation and support E.O. Wilson’s grand vision for Half-Earth. I read the book and I was very moved by it. What he is saying essentially is that there is a way of preserving the planet and allowing the human race to continue the way it is going along, but we have to start now preserving the species that we have. Once extinction begins, it can’t be reversed. 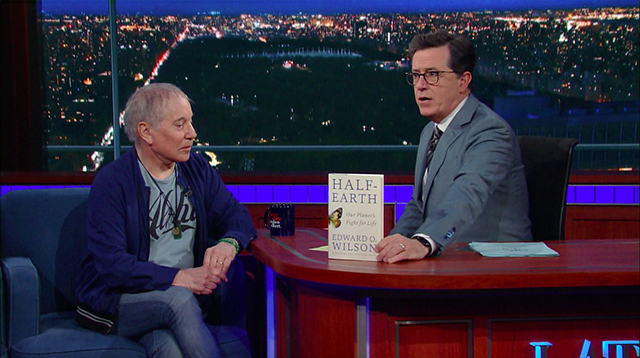 Watch Paul Simon’s interview below with host Stephen Colbert and read a transcript of their conversation about Half-Earth and the importance of protecting species and our planet. Colbert: Well you’ve got a tour coming up starting June 1st. Starting just the end of next week actually, right? Colbert: OK. Great summer tour. But here’s the thing, I just found out about this, is that all profits from this tour will go to E.O. Wilson’s Biodiversity Foundation. For those of you who don’t know E.O. Wilson, you should, because he is one of the great writers on biodiversity. He is a giant in environmental research. This is his book Half-Earth, that came out last year. Why this? Why do you want to do this with your tour? Simon: Well, I was very moved by that book. You talked to him on your show. Colbert: Yeah. Yeah, we had him on the old gig. Yeah. Colbert: So there are no slideshows or anything like that. Colbert: There’s no test at the end? Colbert: At the end of the encores, ok yeah. Simon: That’s a good thought. No. Anyway, I read the book and I was very moved by it. What he is saying essentially is that there is a way of preserving the planet and allowing the human race to continue the way it is going along, but we have to start now preserving the species that we have. Once extinction begins, it can’t be reversed. Once ecosystems are, you know, disintegrating, they can’t be restored. Colbert: People say that we are actually in the middle of a sixth great extinction right now. Simon: And that we might possibly be in the beginning of a sixth great extinction, which means life on the planet dies. All life. Colbert: (singing) Feeling groovy. Keep it light. Keep it light.